shanghai bike polo: a new location ! hey ! if you managed to make it out on saturday, you would know that we now have a new location to play at ! 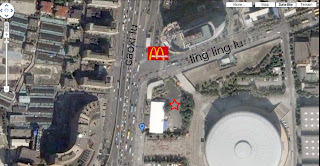 it is in an old empty parking lot on the corner of caoxi lu and ling ling lu, right across from the mcdonalds ! check the aerial photo for precise detail.